With the word "bloody" already in its name, this quintessential brunch drink is a no-brainer for Halloween. While there are lots of different theories on how the bloody Mary was invented, one thing is for sure—it's a classic and it's good! Although traditionally a morning hair-of-the-dog cocktail, they can be served any time of day. This recipe makes one drink, but you can easily double or triple the recipe for a larger crowd. Or, if you are serving them at a party, divide them into shot glasses and serve them as little shooters with the "eyeball" floating in each one. This version is super spicy thanks to a mix of jalapenos, horseradish and cayenne pepper. The spicy and salty rim perfectly compliments the rest of the flavors and the eyeball garnish is just the beginning. Add some celery, shrimp, pickled okra—anything goes with a bloody Mary. A high-quality vodka is a must in this drink, since you don't want your hangover cure causing a hangover. Although the recipe calls for tomato juice, you can also substitute in V8 or other vegetable tomato juice blends. Some people even use Clamato juice for an extra salty bite. The choice is totally yours. Note: while there are multiple steps to this recipe, the Halloween Bloody Mary is broken down into workable categories to help you better plan for preparation and cooking. Cut the kalamata olives into small circles. You will need one little circle for each eyeball, so make sure to choose the best-looking one. Cut a circle into each mozzarella ball and press the piece of olive inside so it sticks. Make as many as you wish. Skewer them onto long toothpicks or wood skewers. Place the vodka, tomato juice, celery salt, black pepper, paprika, chopped jalapeno, cayenne pepper, horseradish, lemon juice and Worcestershire sauce in a cocktail shaker. Fill the cocktail shaker with ice, place the top on, and shake vigorously. Take the lemon wedge and rub it on the edge of the glass that you wish to serve the bloody Mary in. Mix together the salt, paprika, and cayenne pepper in a shallow dish until completely combined. Dip the rim of the glass into the salt mixture so that the edge is completely coated. Pour the contents of the cocktail shaker into the salt rimmed glass. 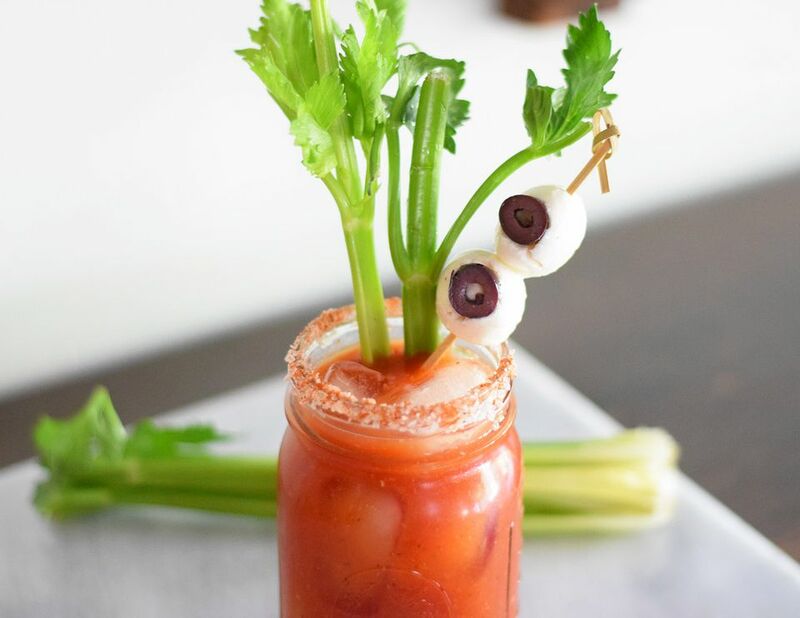 Garnish with the celery and the prepared eyeballs. Serve with extra lemon wedges if desired.